I was watching a new video posted by one of our favorite bullpup aficionados Mishaco and in the video Mishaco went over some history and mods he had made to his X95 and shot it at a range session. Looking through the comments I seen where a person named PLT2081 had posted this. "IWI is selling a improved cocking bar for $39.95 they say this is to enhance extraction. I own an X95 and have had extraction issues since it was fairly new. Also as far as the accuracy, I contend it is the top rail height is too low. Once mounting my Aimpoint T1 in a 1.94" height mount the rifle was much more accurate. The very small design issues with this rifle are an easy fix and if IWI would just admit that and make the adjustments would be great. However for whatever reason they will not be upfront. IWI as a corporation is the worst thing that ever happened to the greatest bullpup to date.﻿"
Now my X95 does not shoot terrible and sometimes can get some 1.25"-1.5" groups but is the height of the rail a real thing as PLT is saying? I figured the raised razor rails that are available were more of a comfort thing and my stock rail height never bothered me but can raising the rail help in accuracy or is it an individual thing per user? I don't see how that alone makes the rifle more accurate but maybe i'm missing something? What say you? The “improved” articulated cocking bar/charging handle is the original design used on the actual non-civilian and IDF issued x95’s. Not sure quite why they went with the non-articulated one for a while. However they all now have the IDF charging handle/barrel band coming from IWI. I replaced mine with the IDF model, it took about 15 minutes. The latest model that has entered IDF service is pretty much the US civilian model. It has a 15” barrel, same full length top rail, and the US rectangular handguard that has had some minor changes from the US model. The rail covers are retained with a screw and do not have the “trap door” to release them. As well as adding a hole in the handguard to route a pressure switch wire in it. The material may also be a denser reinforced polymer like the round handguards. I find almost all rails, whether AR or other, too high. I do hear a lot of complaints about the height of the rail on the X95 being too low though. I don't know if my facial bone structure is different or I'm just using a higher reference point to get a good cheek weld, but I actually needed to add a comb riser to get my cheek weld high enough to center my ACOG properly. Ultimately, what we have is a problem that no company can compensate for; all people are different. I believe PLT2081's accuracy problems were due to his mount rather than equipment based. Because he was having trouble with his optic being too low, he was probably having consistency issues with how the rifle was mounted. By getting the optic better situated for him, it probably helped him be more accurate rather than actually improving the rifle's accuracy. This is a perfect example of what I'm talking about. Look at his cheek weld. Lack of cheek weld would be a more accurate description. As long as he's just barely touching the comb of the stock with his cheek, he'll have inconsistencies. In this case, he could use a comb riser. The material may also be a denser reinforced polymer like the round handguards. Sounds nice. The current civvie version does feel very flimsy to me. I always just thought it was the thin rail covers. So here's yet another reason for the round handguards: denser, tougher plastic. Not trying to be facetious here, but FYI, Misha is blind. A lot of people do complain about the rail height on the Tavor, and opt for riser rails. I haven't had any issues with it. It's hard to imagine how raising the optic would be a good idea though, since the height over bore is already so high. Seriously? OK, I didn't know that. Even so, the picture is still a valid representation of what I see a lot. Agreed. The height over bore is very high. Alas, it's very difficult to make that any lower. I do like that the bore is low as it helps tremendously with control. I use the ITL/mars sight on top of the rail which is a bit higher than if mounted directly to the barrel like in the IDF. Works fine for me. Because he was having trouble with his optic being too low, he was probably having consistency issues with how the rifle was mounted. By getting the optic better situated for him, it probably helped him be more accurate rather than actually improving the rifle's accuracy. Well said. That's what I was thinking as well. It's clear now that IWI Isreal and the good old U.S of A's idea of acceptable accuracy were miles apart. The pulling of the T7, and watching the shot show video 2019 where the presenter articulated how < 4moa may be within spec, however it is not good enough and that IWI US needed explain that to IWI Israel. I listened and went wow! Direct impingement. That will improve Tavor accuracy. As far as the rail goes, I replaced mine with the Gearhead Works Razorback. The Razorback is the best modification you can make. You could use a riser if you are on a budget. As for the cocking handle, I guess if you are going into combat with dirty conditions or using steel case ammunition, it may be worth the change. The non-articulated handle on my rifle works perfectly fine. In this case, he could use a comb riser. 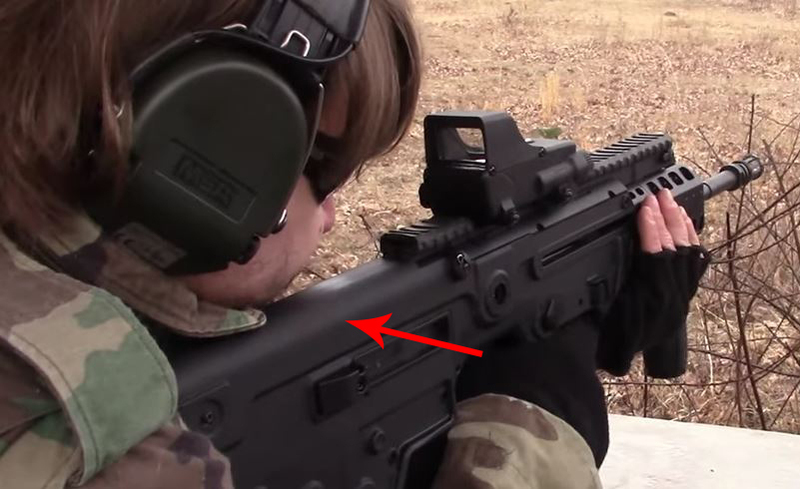 Where does one get a comb riser for an X95? It really just is an individual user thing. The important part is getting a good cheek weld and position on the gun and then raising your optics. You'll notice that the Tavor iron sights are MUCH longer than AR iron sights which lends creedance to the idea that you should be mounting an optic higher up than you would on an AR-15. However here's the thing he's forgetting, there's nothing wrong with simply using taller scope rings, red dot mounts, etc. You can always put on a higher mount but no mount in a world can put the optic lower than the rail. Also the lower rail saves on weight. The lower rail gives someone with a shorter neck the option to put the optic closer to the rifle and thus getting a smaller bore sight relationship which is a good thing as the farther away you get your optic form the bore the harder it is to zero for more ranges. Now what complicates this, and I think that goes to the heart of the video saying he'd like a higher rail in general is that a GLUT of scopes, sights, and optics sold at AR height. If you have a higher rail you can just use AR height optics and sights and that's a net benefit. Personally I have the higher rail because I wanted the cantilever forened to free float my barrel but there's nothing inherently wrong with the X95's lower rail, it's just like anything else with pros and cons. Oh also about the cocking bar. Manticore also makes a very nice folding one you might want to consider. IIRC in IWI USA's video about the new cocking bar they talk about why they went with the different cocking bar. If forget what it was but it wasn't out of the blue. That said I wouldn't replace a X95's cocking bar with the new improved one when manticore's does the same thing but gives you more grip and auto folds but that's a personal thing. A Manticore Arms Cantilever Forend will raise your rail and free float your barrel. I'm not to surprised to be honest. I'm just talking complete BS here and I wasn't in the military so don't take me as a good source but for troops who aren't designated marksmen I think they're perfectly fine with a rifle that will hit a person, not necessarily get 1 MOA or sub MOA. From talking with my veteran friends, whom I play ARMA a lot with, the most important thing is volume of fire as opposed to individual accuracy. Actually that was one of the tips in the video on playing ARMA was to utilize volume of fire more rather than expecting to hit anything with an individual bullet. Anyway I'm getting off on a tangent here but whenever you look at AR-15 you'll see manufactuer's keep talking about how milspec is actually quite low compared to the boutique fancy guns you can sell to gun enthusiasts. The army just wants the efficient thing that goes bang and keeps going bang as long as possible for the cheapest price they can because they have to buy tons of them. They aren't buying fancy match barrels for everyone that wear out faster. So I'm not surprised that IWI US, who sells to enthusiast civilians, has different goes then IWI Isreal, who is selling to a government looking to outfit the rank and file. I fabricated the clamp too. Misha’s other problem in addition to his lack of cheek weld is the position of his mepro M5. It is mounted on the rail way to far to the rear, about half the over all length of his reflex sight. If he moves it further forward, it will work much better for him. I noticed it a lot when in Israel. If you look at the IDF mounting of the M5’s and M21’s, MeproMor’s, they are always mounted more forward. Even on the newer full length rails. Another consideration is the eye relief, in that if you have an M5 mounted in the same spot as an M21, the reticle on the M5 is closer to the rear than the M21’s because the glass is on the rear of the M5 and the M21’s is on the front of the sight, which is roughly a 2-3 inch difference. That is really a lot if you think about it. The newer full length rails basically just replace that meprolight magnifier proprietary mount on the rear section with a standard magnifier optic picantinny rail. 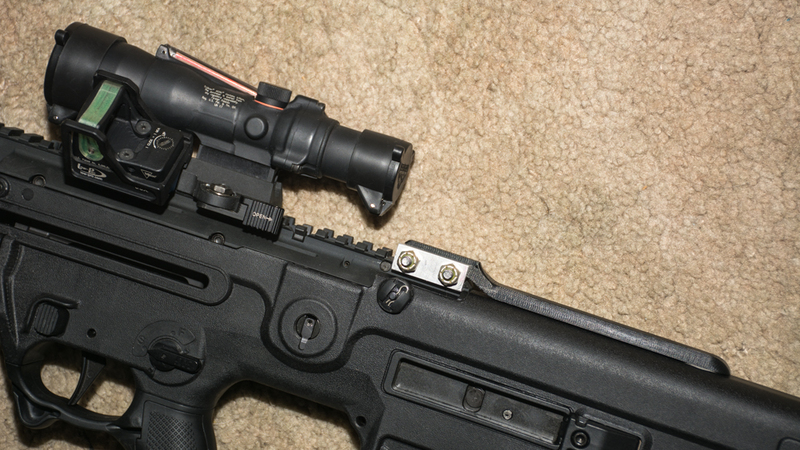 The reflex sights are still supposed to be mounted generally between the “2 side screws mounting the rail”. The x95 was designed from the early days with the MARS with reflex sights to be more forward. Misha’s other problem in addition to his lack of cheek weld is the position of his mepro M5. If what BellatorInvictus said is true, then the position of his sight is irrelevant. Very interesting. I'd have to take something off the rear rail but I'd definitely like a cheek riser for the X95. You know of any commercial ones out there? I don't know of any commercially available cheek risers for the X95. I also have a new design in the works. The one pictured shows a design that I made which attaches to the picatinny rail at the back. I've learned that this is unnecessary. I haven't printed one yet, but I'm going to make one without the pic rail attachment and simply put it on with double sided 3M tape. It's amazing how well that stuff holds and it can still be removed without leaving any marks or residue behind. If you're interested in getting one or just discussing this further, just shoot me a PM. Sending a PM though it's funny you mention it because literally the day after I posted my message I noticed these in my local store and i figured it was worth a try.